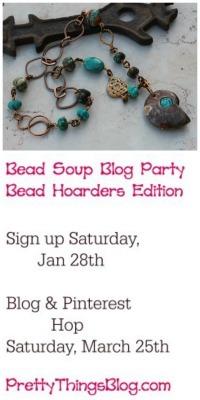 The Bead Soup Blog Party was a huge success! 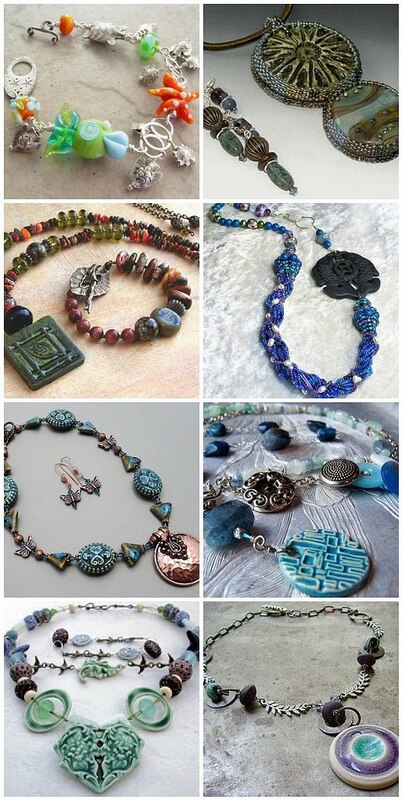 My main goal when throwing these parties is to introduce all types of bead and jewelry artists, get them to know each other through their blogs, and finally, help people break out of their comfort zone by presenting them with a set of beads that they have no inkling of -- they have no idea what's coming their way. This party, even more so than last party, really had a lot of participants commenting on how hard they worked to create with what they were given. There were LOTS of gorgeous beads handed out by many talented bead artists, by many times, the colors of the style or even the medium was completely NOT in the beaders realm of general comfort. But that's ok! That was what this was all about. That's what, I think, makes this a great party -- the opportunity to spread your wings and really fly. I also think it gives people the incentive to keep up with their blogs, if they've fallen behind, or to perhaps use their blog in a different way, reaching out to people they've just met or hope to meet. Thank you so much for joining my party -- it warms my heart to see all the AMAZING work that went into it and to have read all the wonderful posts about the creative process that went into each piece. Thank you again, from the bottom of my heart, for taking this journey with me. 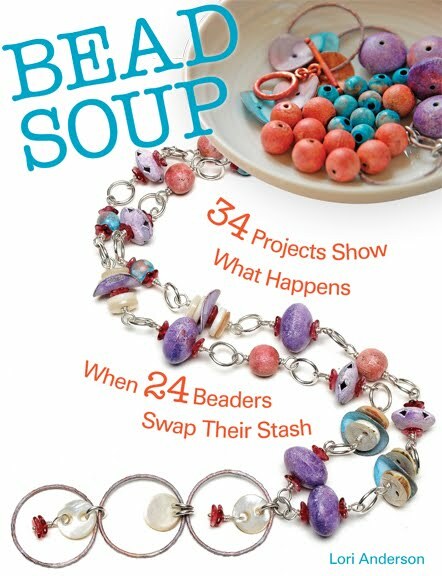 It was a joy to take part in your lovely hosted bead soup swap parties and I look forward to taking part in future bead soup parties, thanks again for being a great host. I did miss being in the Bead Soup Party this time around but I did make it to several blogs to look at all the beautiful work that everyone did. I hope you do it again so I can participate! It was amazing! Thank you for taking the time to coordinate all of us. I look forward to participating in the future. I totally agree, it was a whole lot of fun. Thinking outside the box, meeting fellow beaders and bloggers, reading about their creative process... I could go on. Thank you, Lori, for hosting and coordinating it. I am ready for the next one, whenever you are! May all you days be migraine free is my wish for you! Thank you. Thank YOU Lori for hosting this spectacular event! Can't wait for the next one!!! Lori, this was so much fun, I don't know where to begin! I had such a great time working with these materials, and they aren't things that I would normally choose myself. However, after finishing this piece (and at least starting another one), I think I will be looking around for more beautiful Venetian glass to incorporate into my bead weaving! I'd love to participate in another swap, maybe after my farmers market and show season ends at the end of September. Thanks so much for organizing this! What fun! This was my first bead soup party and I guess I didn't know what to expect. Little did I know how much talent was out there! I liked my second piece the best, but it was still nothing compared to all that sparkled on the other blogs! Thanks for organizing and giving me oppertunity for more inspiration! I wasn't part of the Bead Soup, but truly enjoyed seeing what everyone did! I'm looking forward to participating in any future soups! You are a delight, Lori. And I would gladly participate again. I have met such wonderfully talented women and enjoyed so many lovely morsels. 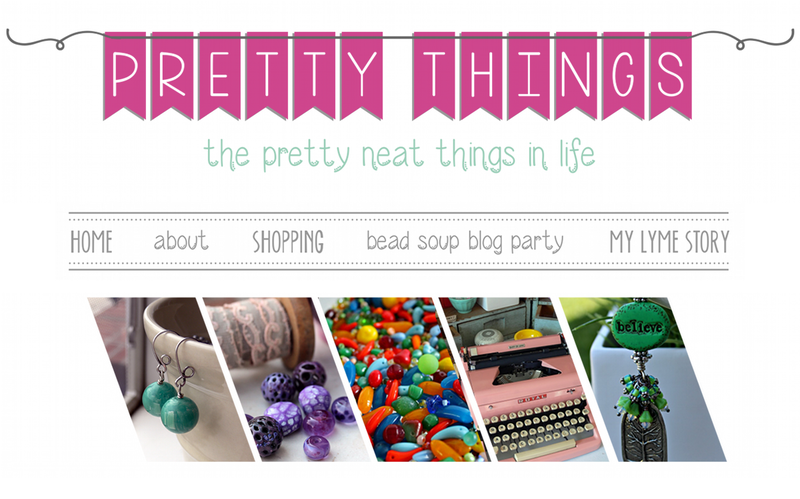 Thank you for facilitating this most excellent blog hop party! Thank youy for your work in creating this opportunity. It was fun and a challenge. Thank YOU so much for hosting such a great party! I fell behind in visiting and commenting because of family illness but will enjoy catching up on everyone's wonderful creations this week. I have had an absolute blast. I'll take part in future bead parties--I love the idea of meeting someone new and receiving a stash of beads that I'm not familiar with or sometimes--not comfortable with. I'll second Kella--thank you for being a great hostess and the event's coordinator! Thanks for hosting another great party Lori! Especially with all you had going on, I think you (and the party participated) did a great job! Looking forward to the next one! Thank you for another fun & wonderfully organised party Lori! I'm looking forward to the next one. It was so much fun to participate and I got a chance to visit some great blogs and some very talented designers. They're all amazing and everyone did a GREAT job with their mix of beads. Thanks Lori! Looking forward to the next one. Lori...thanks again for hosting the party! 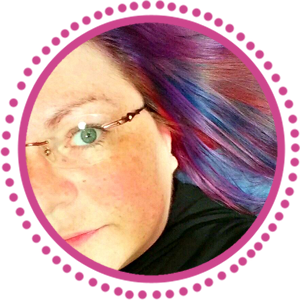 I had a blast and am still blog hopping! Thank you for taking the time to coordinate the bead swap! It was great and forced me to go out of the box for my design. Thanks Lori for hosing this party. It was my first and won't be my last. I plan to take part in as many as you put out there...LOL. I may even enter some challenges on other bead sites. Thanks again and I'll be watching for your next event. Looks like another successful party! Look forward to being part of the next one! I can't wait until you do this again. I didn't "find" you until this was underway but would love to participate in the future!! All of these are just wonderful. I loved those little butterfly earrings with that one set. Thanks so much Lori for offering such a wonderful swap. I look forward to the next Soup!